As we reported earlier this month, the Bluetooth special interest group (SIG) has officially announced the latest superfast version of its tech, with Bluetooth 3.0+ HS enabling faster transfers of high def content via the 802.11 protocol. Version 3.0+ HS means that data can be transferred wirelessly at an "approximate rate of 24Mbps." Bluetooth SIG spokesman, Mike Foley, told Engadget that computers with a Bluetooth 2.1 module and an 802.11 WiFi radio could be upgraded to the latest 3.0 version. The report also adds that, "while next-generation cellphones, PMPs, UMPCs, etc. will obviously transition to BT 3.0 in due time, we could also see it infiltrating camcorders, cameras, televisions, projectors and external hard drives (among other things)" all of which should arrive on the market in the next "9 to 12 months." "Like Ricky Bobby in Talladega Nights, this latest version was 'born to go fast," writes Foley over on his blog. 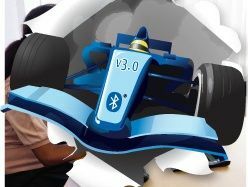 "Utilizing the 802.11 radio was a natural choice as it provides efficiencies for both our members and consumers – members get more function out of the two radios they are already including in devices, and consumers with Bluetooth 3.0 + HS products will get faster exchange of information without changing how they connect. We are excited to expand the possibilities of the PAN [Personal Area Network]."